Conveniently located in Kahului, the Maui Arts & Cultural Center is located at One Cameron Way off Wahinepi‘o Road. Complimentary parking is available for all Castle and McCoy Studio Theater performances. Parking is available on a first-come/first-served basis in the main lot at the Maui Arts & Cultural Center. 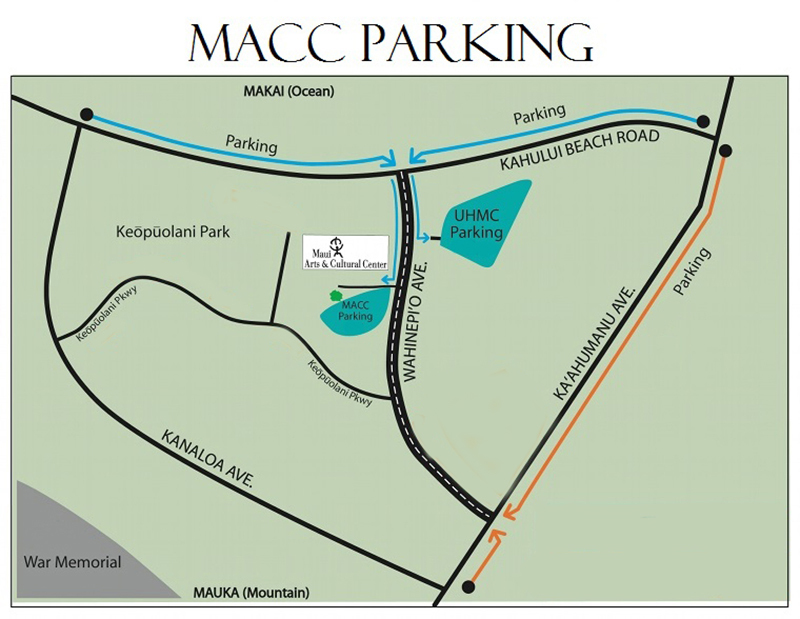 In the event that the MACC's parking lot is full, overflow parking is available across the street at UH Maui College. 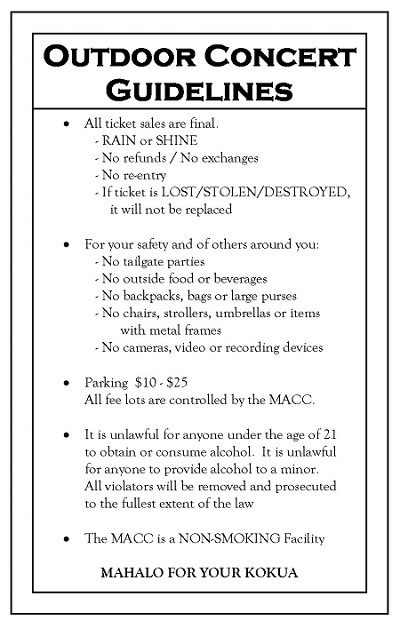 For outdoor events, there is a charge for parking. Please contact the Box Office or visit our website for these performances and applicable parking fees. All theaters at MACC are wheelchair accessible. The wheelchair seating access for the Castle Theater is on Orchestra level; there is a wheelchair-accessible elevator to other levels. Wheelchair seating for McCoy Studio Theater is on floor level, near the stage. Wheelchair accessible restrooms, both male & female, are available in Yokouchi Founders' Court, off the McCoy Courtyard, and on Castle Theater Lobby level. Due to the nature of outdoors shows and the flexible environment & set-up, seating arrangements vary for Amphitheater events, on a show-by show basis. Please call or email regarding specifications for each outdoor event. Service animals are welcome at The MACC; we accommodate trained licensed Seeing Eye and Disability Assistant companions such as dogs or other animals. Listening systems are available Audio devices are available for Castle Theater events for assisted hearing: the Castle is equipped for people with hearing impairments with a Sennheiser infra-red system which allows each patron to control the sound level to their satisfaction. Head sets for this system are available at no cost to patrons (we do require some form of identification as collateral) and may be requested from the house manager or the ushers in the Castle lobby upon arrival. We accommodate trained licensed Seeing Eye dogs. Please ask the house manager or row ushers if you would like assistance to and from your seat. Please advise the Box Office in advance of your specific requirements. We will try to accomodate everyone's special needs!